Rust Never Sleeps was released in May 1978 on Reprise Records. Producers were Neil Young, David Briggs and Tim Mulligan. Most of the songs were recorded live at San Francisco’s Boarding House during the tour Neil Young did with the Crazy Horse. The album cover is a photograph of the stage with a giant microphone and amplifiers that were part of the show. Just like the live shows the first part of the album is acoustic and the second is electric. Rust Never Sleeps is one of Neil Young’s most striking albums – it steers from majestic acoustic like “My My, Hey Hey” and “Trasher” to a roaring side B. The acoustic part ends with the great tune "Sail Away" that is actually a Comes a Time outtake. “My My, Hey Hey” has become one of Neil Young's signature songs and he wrote it together with Jeff Blackburn. On Rust Never Sleep it starts and ends the album with one acoustic (“Out of the Blue”) version and one electric ("Into the Black") version. The sound from the audience are removed in the production, but can be heard on some occasions. The whole set can be heard and seen on the fantastic Rust Never Sleeps concert film from 1979. Some of the songs are about the need to capture the intensity in life and not stagnate. “They were lost in rock formations or became park bench mutations / On the sidewalks and in the stations, they were waiting, waiting” ("Trasher"). This is of course also what the famous line: “It’s better to burn out than to fade away” is all about. 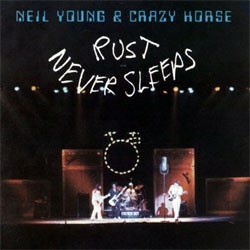 Which also corresponds to the album title that Neil Young explain his thoughts about in an interview: "I can relate to 'Rust Newer never sleeps.´ It relates to my career. The longer I keep going, the longer I have to fight this corrosion". Neil Young can outwrite, outsing, outplay, outthink, outfeel and outlast anybody in rock & roll today. Of all the major rock artists who started in the Sixties (Bob Dylan, the Rolling Stones, the Who, et al. ), he's the only one who's consistently better now than he was then. Rust Never Sleep was in the next year followed by a live album, Live Rust.